Family Ministries is a ministry of grace which acknowledges as normative the biblical teachings relating to the family and holds high God’s ideals for family living. At the same time, it brings an understanding of the brokenness experienced by individuals and families in a fallen world. Thus Family Ministries seeks to enable families to stretch toward divine ideals, while at the same time ever extending the good news of God’s saving grace and the promise of growth possible through the indwelling Spirit. Family Ministries focuses on people in relationship. It is concerned with the needs of married couples, parents and children, the family needs of singles and all members of the wider family circle as they pass through life’s predictable stages and contend with unexpected changes in their lives. Family Ministries reinforces and encourages wholesome families. It helps individuals build and maintain strong family relationships because it recognizes that healthy Christian families make strong members for the kingdom of God and present a winsome witness to the community around them. Family Ministries promotes understanding, acceptance, and love within the family and in the larger family of God and fosters the reconciliation and healing between the generations promised in the Elijah message of Malachi 4:5, 6. It extends hope and support to those who have been injured and hurt by abuse, family dysfunction, and broken relationships. Family Ministries fosters competence in a variety of interpersonal skills needed in relationships. It provides growth opportunities through family life education and enrichment. It encourages individuals, married couples, and families to avail themselves of professional counseling when necessary. An adequate ministry to families will include: premarital guidance available to all couples before marriage; marriage strengthening opportunities; parent education, with attention given to the special needs of single parents and step-families; instruction in family to family evangelism; and support ministries to help families with special needs. To assist church leadership in compiling family demographic data both within the church and in the surrounding community to clarify target groups for a ministry to families. To assist church leadership in assessing the needs of church members for family life education, enrichment, and counseling; and in developing a plan for utilizing community and church resources to address these needs. To encourage sensitivity to the impact of church programs on family life in terms of the expenditure of time, energy, money, and other family resources required. To participate with the conference/mission Family Ministries Department in implementing family emphasis programs promoted by the department. To cooperate with church leadership to design, plan, and implement additional family life features and programs as needed, both for family nurture within the membership and evangelistic outreach to the community. To foster a climate of warmth and fellowship, engendering a sense of “familiness” in the congregation and a redemptive spirit toward families in need of support and encouragement. To chair the Family Ministries Committee. To represent the needs and interests of families through membership on the church board, and to coordinate Family Ministries plans with the overall church program. To inform the pastor and church board of Family Ministries concerns and achievements, and to encourage funding and support for ministry to families. 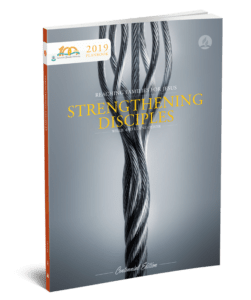 To identify church and community resources which foster relational growth and provide help to meet critical needs, and to heighten awareness of these resources among church leadership and families.